The mechanisms of reaction of methionine with hydroxyl radical are not fully understood. Here, we unequivocally show using electron paramagnetic resonance spin-trapping spectroscopy and GC–FID and GC–MS, the presence of specific carbon-, nitrogen- and sulfur-centered radicals as intermediates of this reaction, as well as the liberation of methanethiol as a gaseous end product. 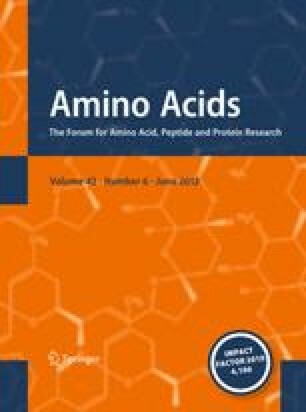 Taking into account the many roles that methionine has in eco- and biosystems, our results may elucidate redox chemistry of this amino acid and processes that methionine is involved in. This work was supported by the Ministry of Science of the Republic of Serbia, Grant numbers 173014 and 173017. We are thankful to Mladen Simonović at the Institute of General and Physical Chemistry, University of Belgrade for technical help.